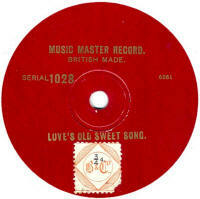 British 78rpm record labels whose name begins with M. Using the letter links below you can see pages for other letters. 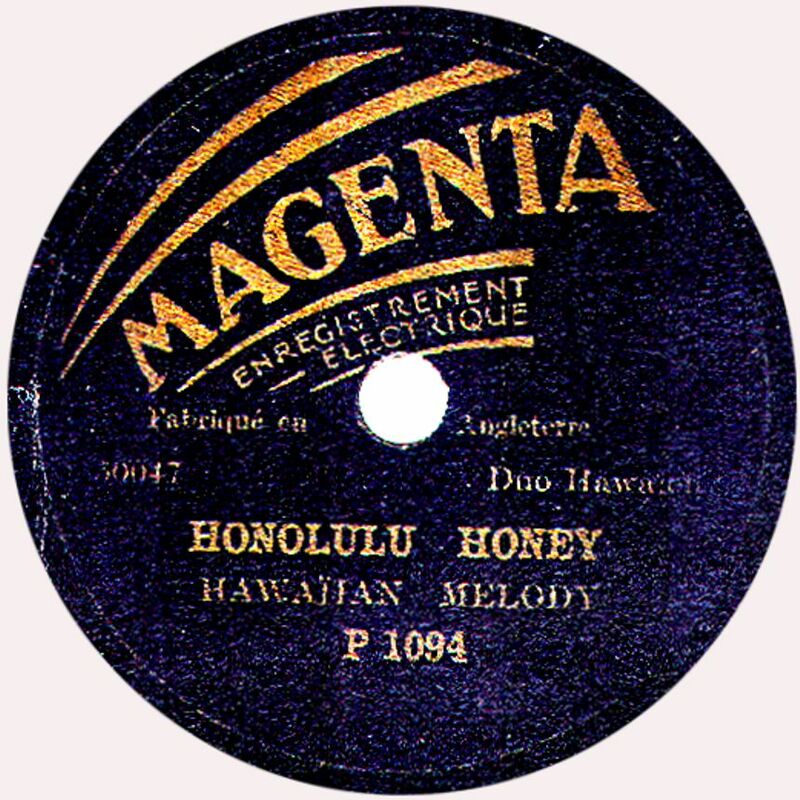 Magenta This was an 8" disc manufactured by Edison Bell in Britain, for export to France. 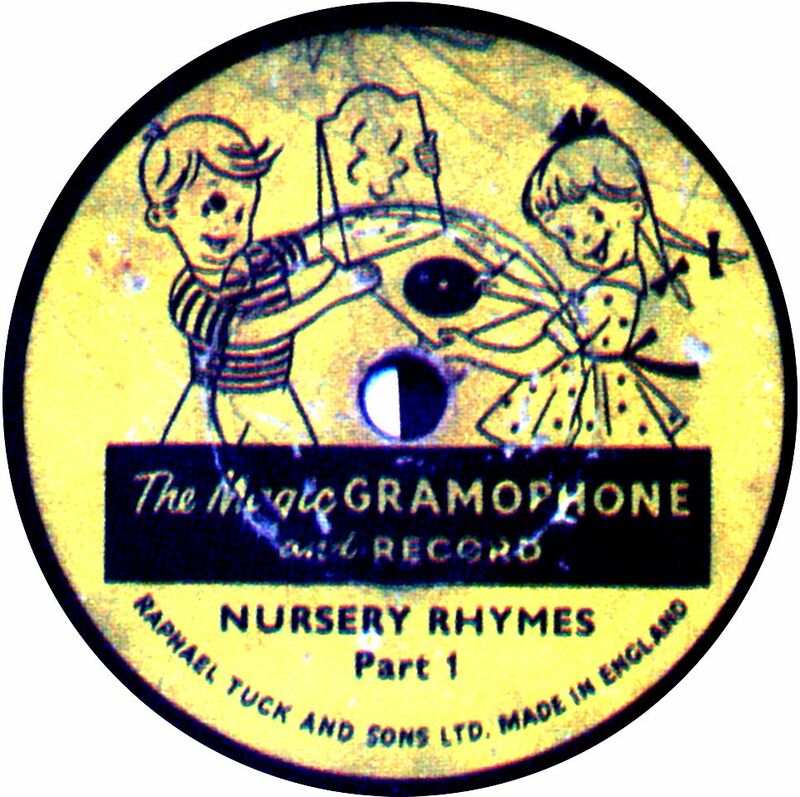 Magic Record This was a 7" vinylite disc produced in the 1950s for Rapael Tuck & Sons as part of their Magic Gramophone And record. It is not known what the magic actually was, but the late Eddie Shaw reported that they came in a box complete with a colouring book and water colours. Label image courtesy of Arthur Badrock. Majestic These were produced in Blackpool, Lancashire by the North British Recording Company. The owner was Harry Wilkinson, whose patent mentioned on the label actually refers to a home-recording system. 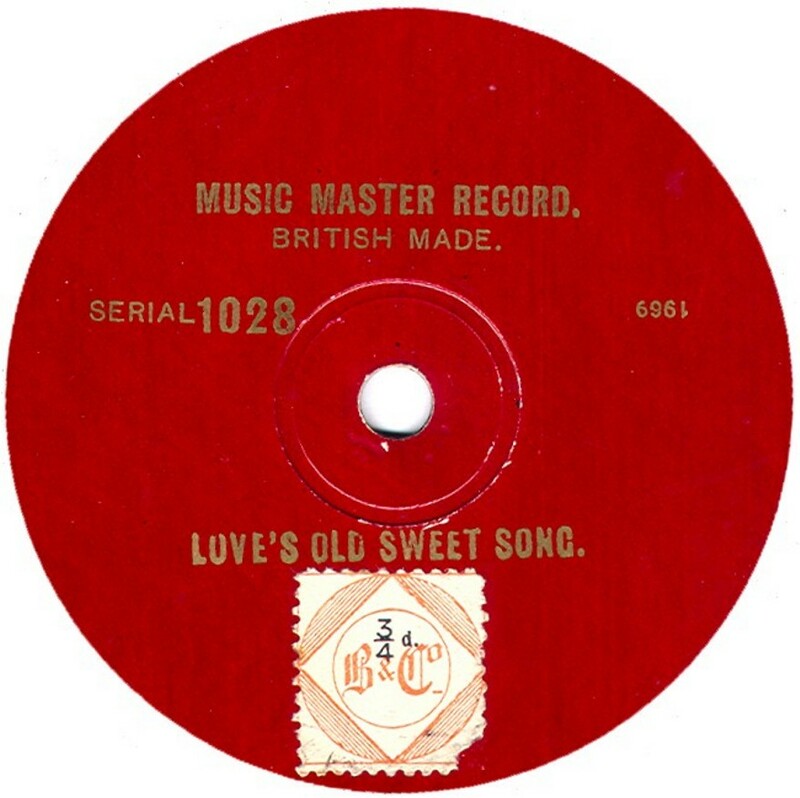 Majestic records date from 1933 - 1934 and seemed to be made on a rather ad-hoc basis, so were most likely to have been privately produced (rather like Teledisk), rather than sold in any shops. 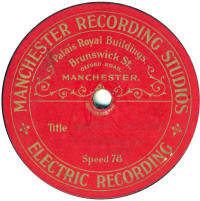 Manchester Recorded Sound One of the many small post-WWI recording businesses which sprung up aound the country. No prizes for guessing where this one was based. Manchester Recording Studios A privatre recording company based in Manchester. 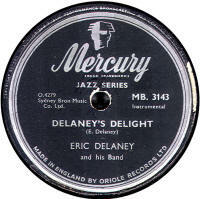 The label's design is very pre-WWI in style, but the record is probably from the 1940s or 1950s. 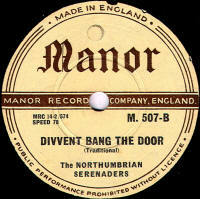 Manor The Manor record label was a product of Northern Sound Services, who were based in Newcastle-upon-Tyne in Northumberland, at Broad Chare, Quayside. 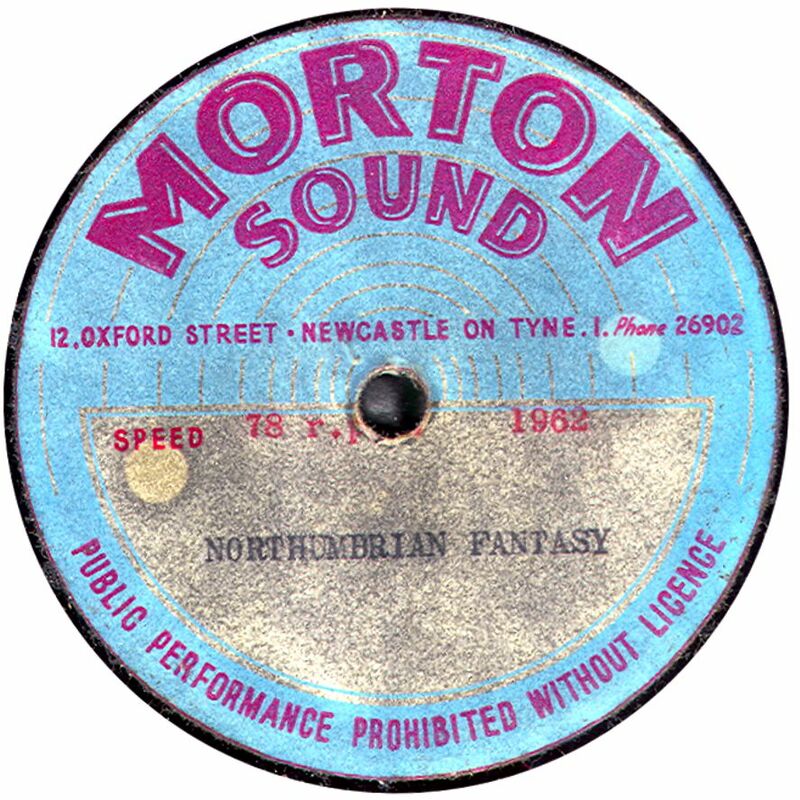 Northern Sound Services did their own recordings and pressed records as well. 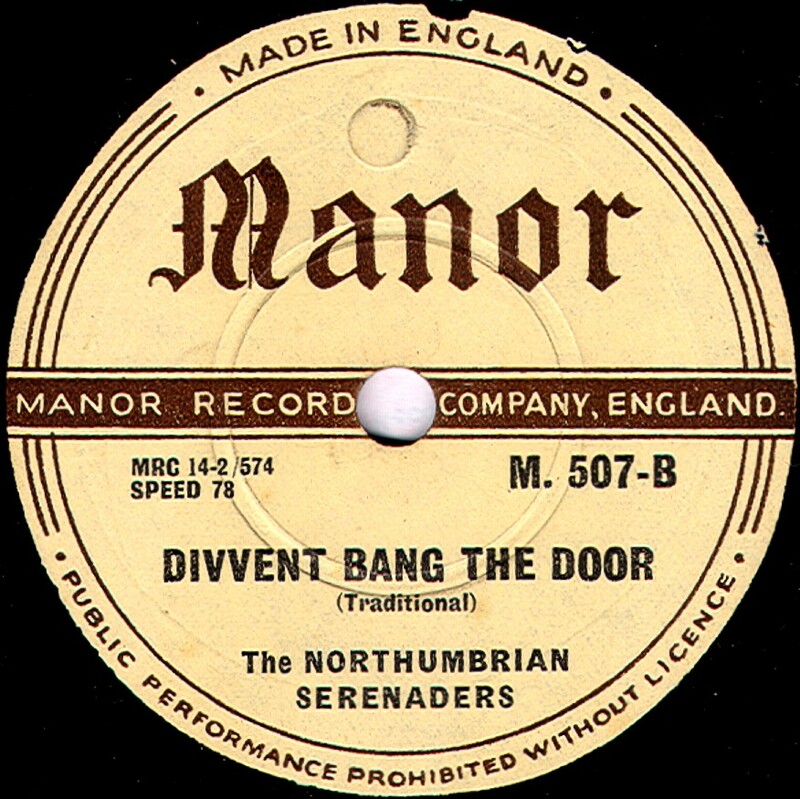 NSS's own label, called Northern Sound Services, was for private or personal recordings, whereas Manor was a commercial label, the records costing 5/9 and dating from the early to mid 1950s. 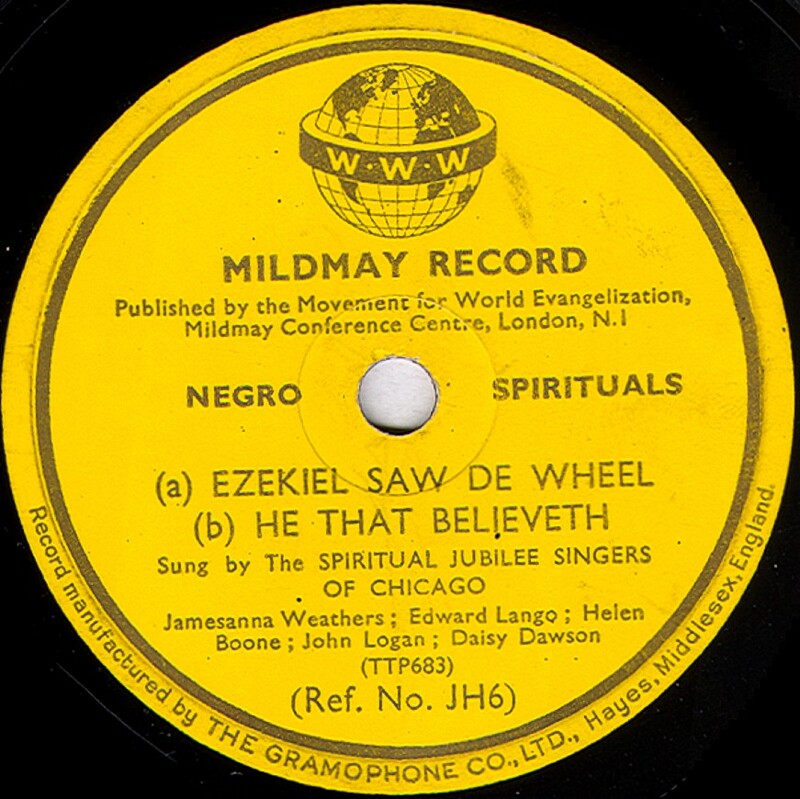 Their masters usually had NSS- prefixes and can be found on other small British labels of the period, buch as Bajedo and Nigerian Accurate records, both produced for exporting to West Africa. The Manor issues generally had MRC- prefixed masters but also show a 0 (or O) prefixed number which implies a link with Levy's Oriole records. It is thought that Levy's pressed most of the Manor issues, presumbly because, as a commercial proposition, higher numbers were being made than could be produced in NSS's own plant. 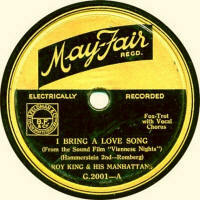 Marathon A very early long-playing record, Marathon were available from 1912 to 1915. It was the invention of Percy J. Packman who hit on the idea of a v-shaped vertical-cut groove which allowed a very fine pitch to be used while still maintaining 80 r.p.m, which gave 5-minutes of playing time on a 10" disc and 8 minutes on a 12". Labels were grey with black and white printing and an inordinate amount of information printed on the sleeve. The 10" series started at 101 and ran to 473, the 12" ran from 2001 to 2065. The records cost 2/6 for 10" and 4/- for 12" discs. The flourish under the label name was printed in differnt colours depending on the type of repertoire. 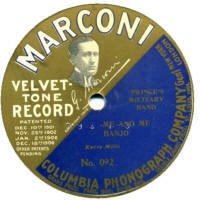 Marconi An American made record which was imported into Britain briefly from October 1907. 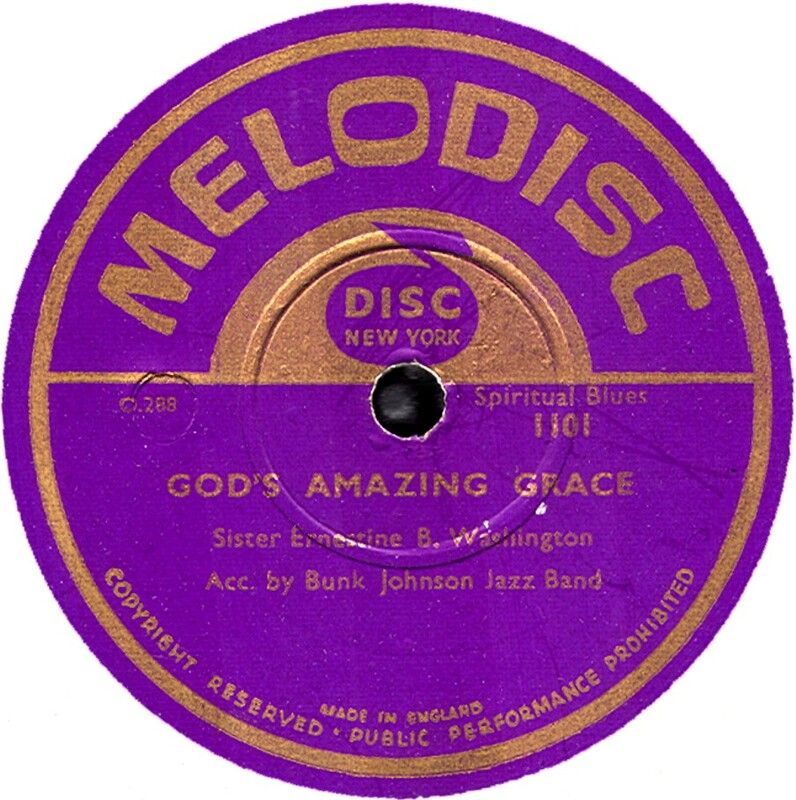 It was a flexible "unbreakable" record (single-sided) with a card or thick paper core, coated in a hardened plastic surface on which the groove was pressed. 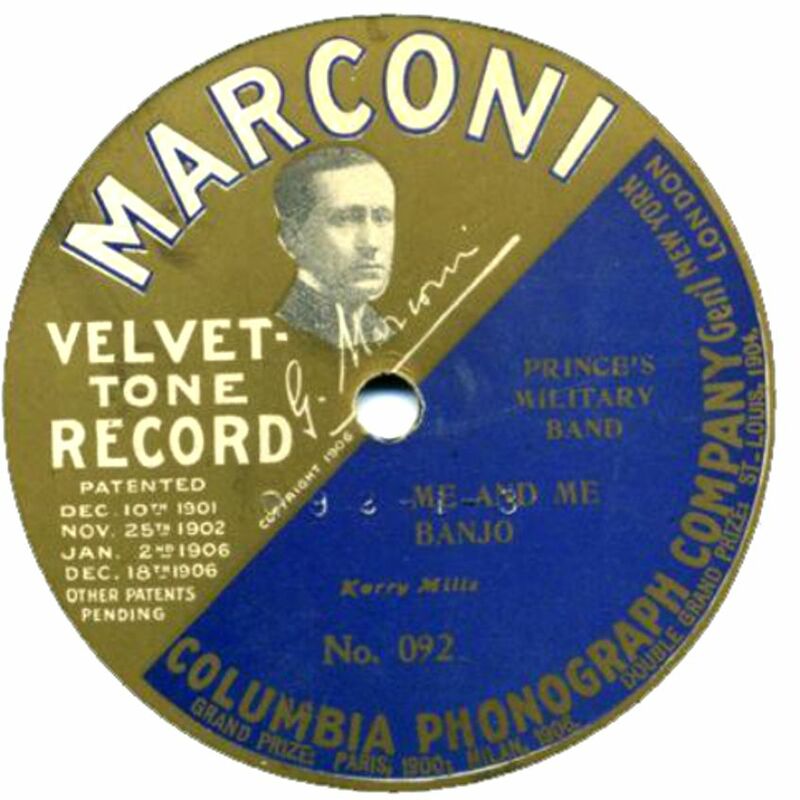 Marconi is said to have been the inventor of this type of disc record. They were manufactured by the American Graphophone Company using Columbia masters, and available in 10" and 12" size., but the British side of the business was not handled by Columbia, as one would expect, but by various appointed factors. Marspen These 5½" and 6" discs were sold by branches of Marks & Spencer (hence the name) in the mid-1920s. 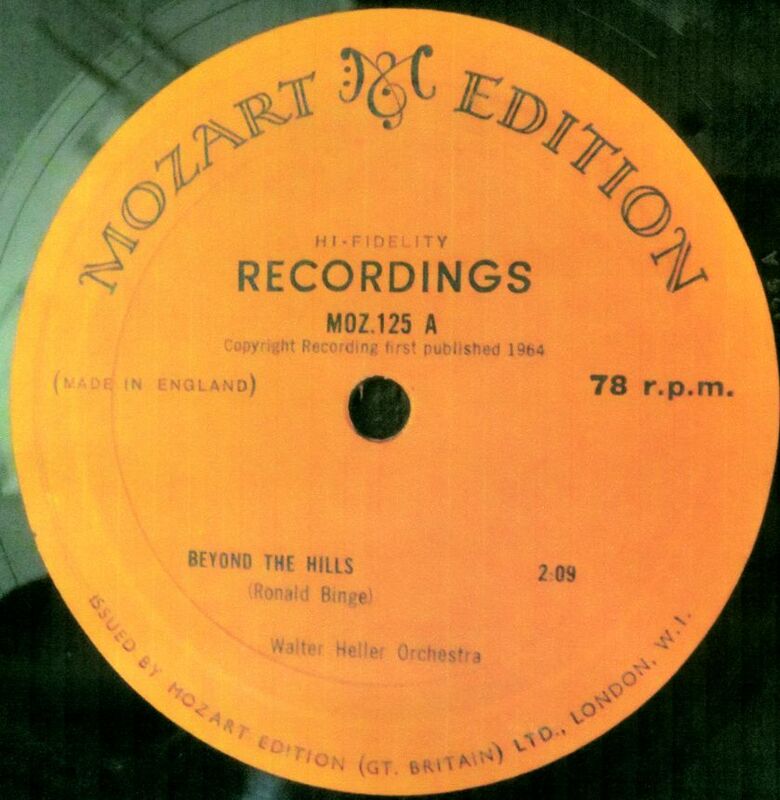 The pressings were done variously by Edison Bell (catalogue 600 upwards) and Crystalate (catalogue 250 upwards) using masters from their equivalent labels (Bell and Mimosa), though many of the Crystalate-produced ones have a special matrix series starting MS-01 which was recorded specially for Marspen (though some at least can be found on Mimosa issues). 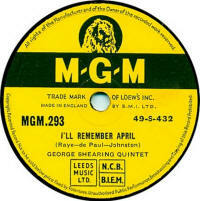 May-Fair May Fair records were available between 1931 and 1933 and were not sold in the usual manner, but exchanged for Ardath cigarette coupons. The records were pressed by Brunswick and Piccadilly and some labels show that they were selected by the ubiquitous Christopher Stone. The catalogue series are in a G-2000 range which, on reaching about 2262, drops the first digit, finally reaching about G-360 before Ardath withdrew the offer and disappeared from the market themselves soon after. (Some records have prefix letters other than G- but the reason behind this is not known). It is believed that Selfridges bought up the unused stock in 1933 and sold them in their department stores. Meade & Fields Mead and Field were manufacturers of novelties for Christmas and parties. The company was formed in 1910 and were still in business in 1960. 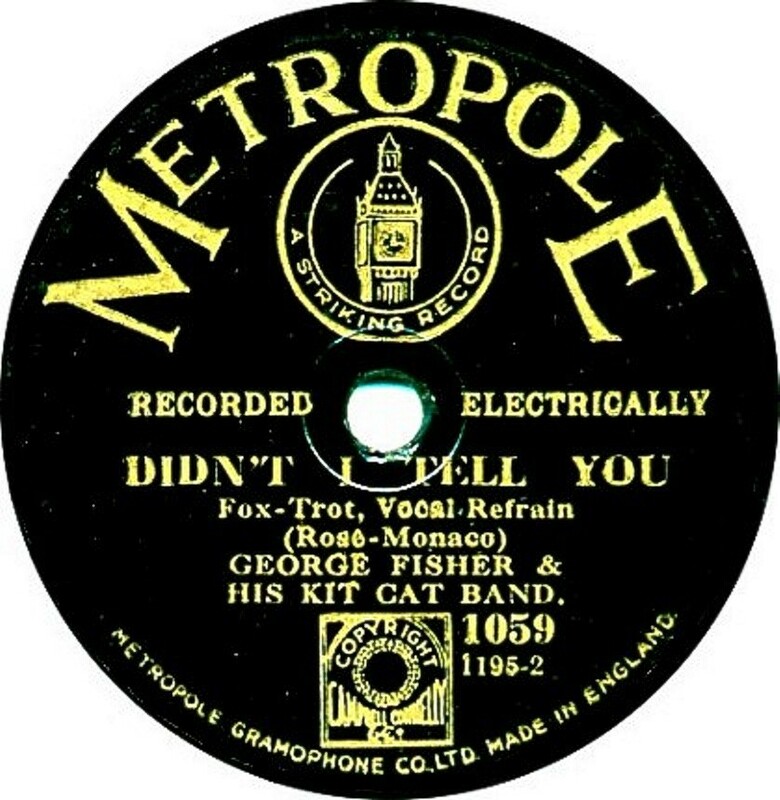 The records such as the one shown here were made for them by Duophone and seem to be mainly pulled from the late 1920s D-500 and F-2000 series, usually in the same couplings as the Duophones. The Mead & Field's labels had black printing but the background colour varies; also sometimes the label was just pasted over an existing Duophone, other times they are properly pressed in labels.. They had no catalogue numbers, though a registration number is sometimes shown. The performers are often anonymous. Information from Frank Andrews' article in "For The Record", issue 20. 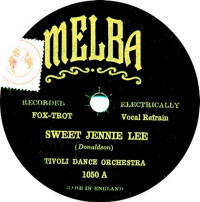 Mecca These were produced for Mecca Dance Halls and were most likely strict-tempo dance records. 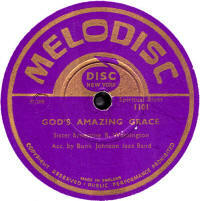 Neither Frank Andrews, nor myself have seen any examples, so did any 78rpm discs with this label name actually exist? 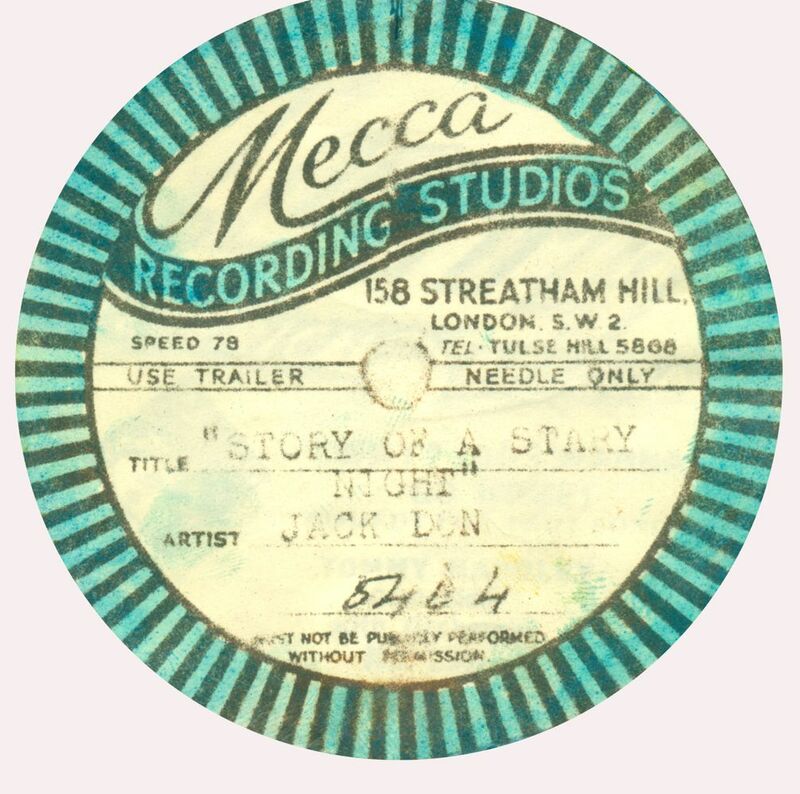 The similarity in name to "Decca" may mean the latter company objected to Mecca being used as a record label name. Recording Studios This was a private recording studio based at Streatham Hill, London. 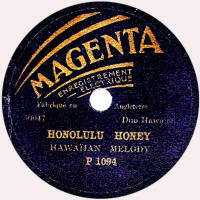 Their records were direct-cut acetate discs, but the dates of operation are unknown, but most likely post-WWII. 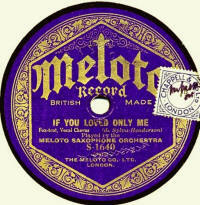 Melba Melba records were made by the Metropole Gramophone Co using matrices also available on Metropole and/or Piccadilly. The reason for the label's existence is not yet known and the very plain label gives no clues. The catalogue numbers are in an 1000- series running (probably) from 1001 to about 1070. My thanks to Charles Hippisley-Cox for the label scan. 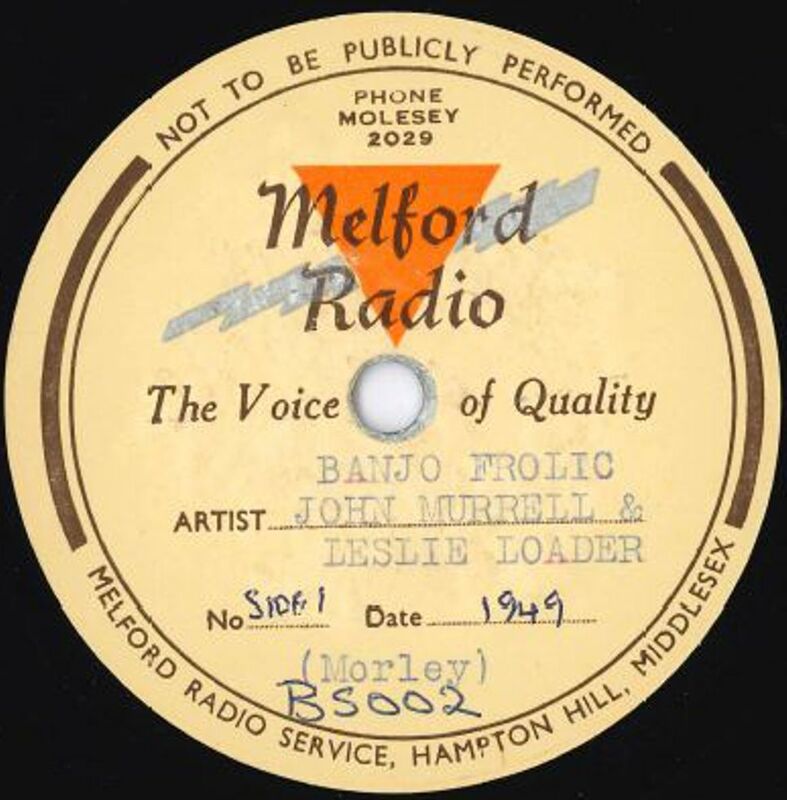 Melford Radio A private recording company, probably named after a shop where the recording service was provided. 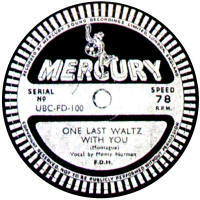 The record dates from 1949. 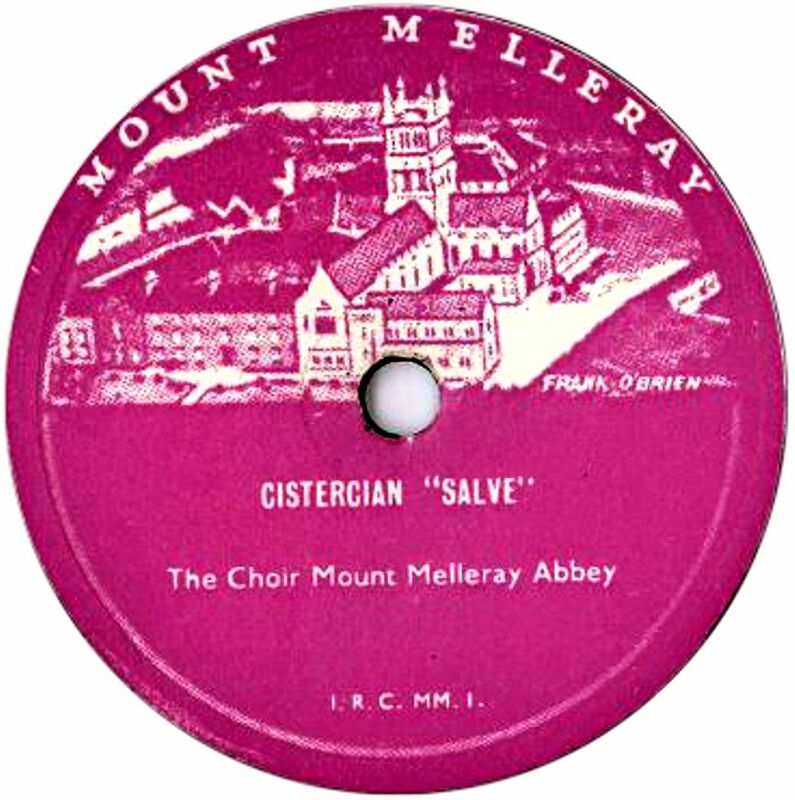 (sold in Australia) A 6" disc pressed by Crystalate using Mimosa / Kiddyphone masters which was made in England in the 1920s, but only made available in Australia. From examples I have seen, the catalogue numbers exactly match those on Kiddyphone. 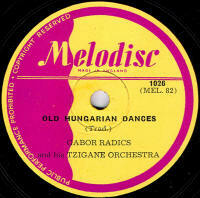 Melodisc A post-WWII jazz label issuing mainly, or possibly only, new American jazz recordings, Melodisc records first appeared in September 1949 and cost 5/9. 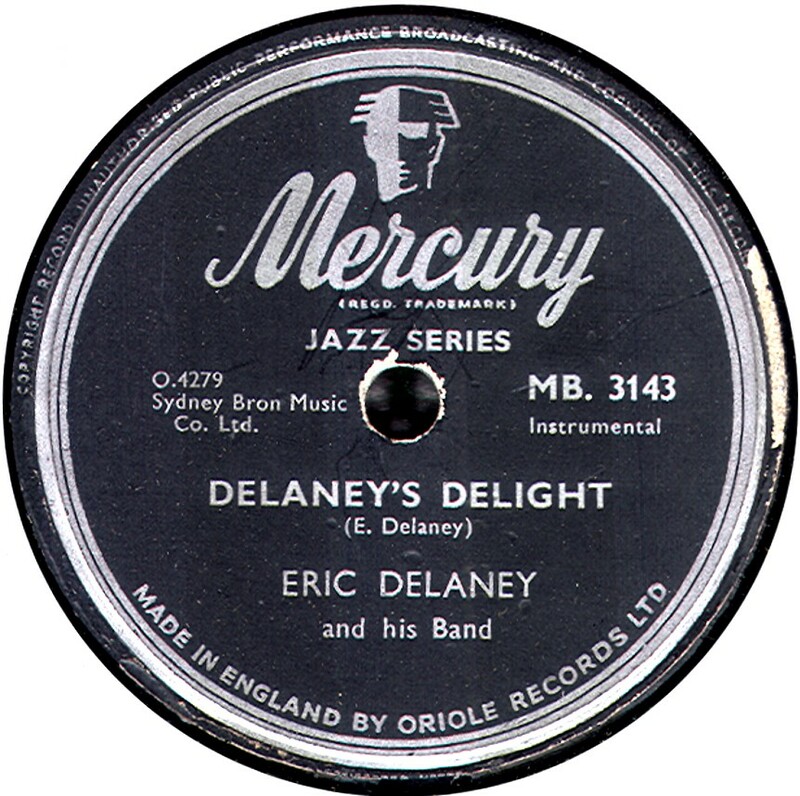 They were distributed by the International Book Shop of 52, Charing Cross Road, London and also Farley Radio Services, and were also available from record dealers. 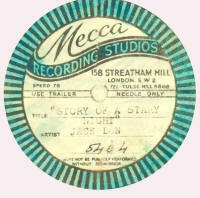 The Melodisc Record Co. Ltd was at 12, Earlham Street, London WC2. 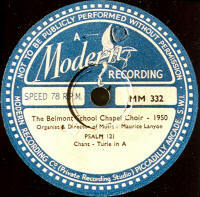 The last 78s were produced in 1960. 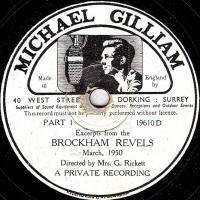 The pressing are belived to have originally done by Oriole, with later copies and re-pressings by Decca. Melody Record These were produced for Morgan & Scott of London during 1918 and used Invicta & Guardsman masters, some dating as far back as 1913. The records state "Made in England" and were made by Crystalate, who pressed Guardsman records at the time. 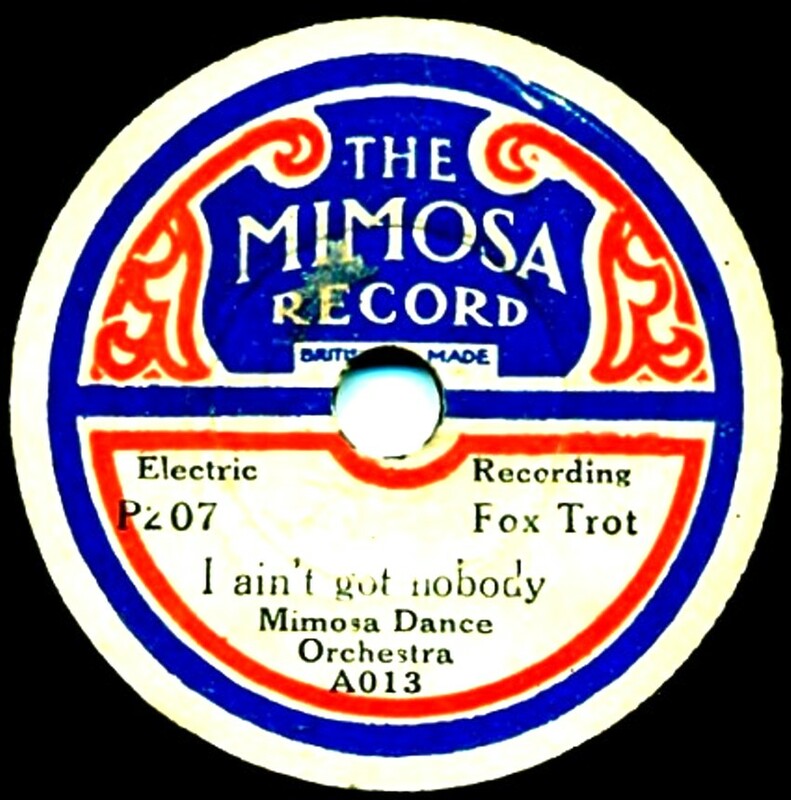 Frank Andrews reports that the first issue of the records was in November 1918, and contained 12 records; a mixture of 10" (at 3/-) and 12" (at 5/-). As can be seen by the listing here, only about 30 different Melody Records seem to have been produced, with catalogue numbers running from 251 to 279 (irrespective of the record's size); this may represent only 3 issues; Frank says they were never mentioned in the trade journals. Melograph The Melograph record company was based in Liverpool from about 1907. 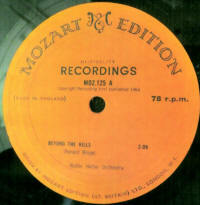 Initially the records were manufactured in Germany, by Hess & Co. of Berlin. 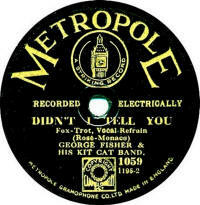 By 1908, Melograph had their own recording facilities in Liverpool, though all known examples of the records still show them as being made in Berlin. 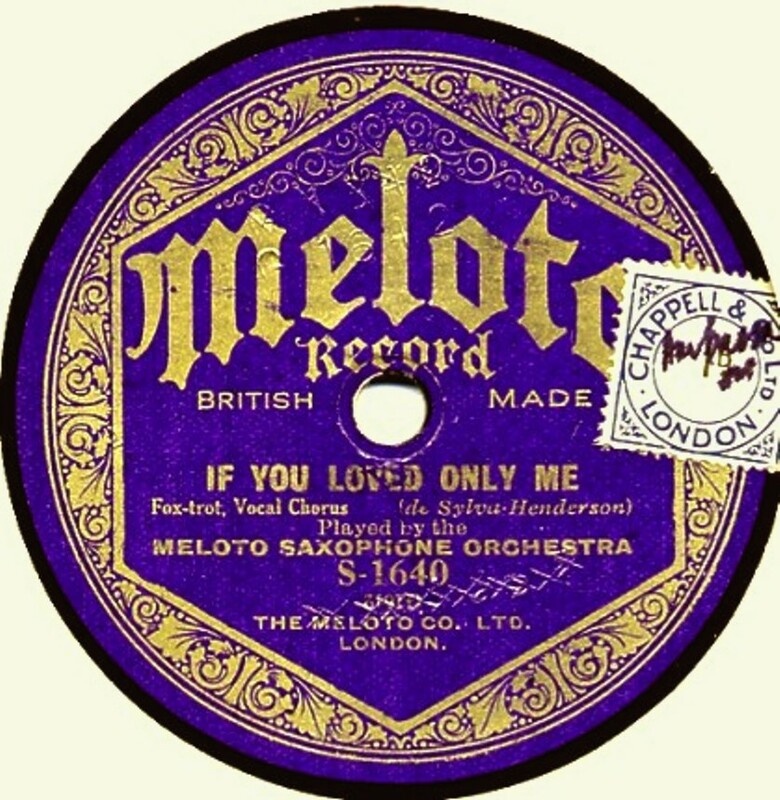 Meloto Meloto are much better known for their piano-roll production than their records which were pressed for them by Vocalion at some point during the 1920s, The catalogue ran from S-1001 up to about S-1800 and included recordings from 1920 to about 1927. The label design remained the same throughout. Memorial Record This was a special 12" record made by Columbia, of the funeral service of the unknown soldier, which took place at Westminster Abbey on November 11, 1920. 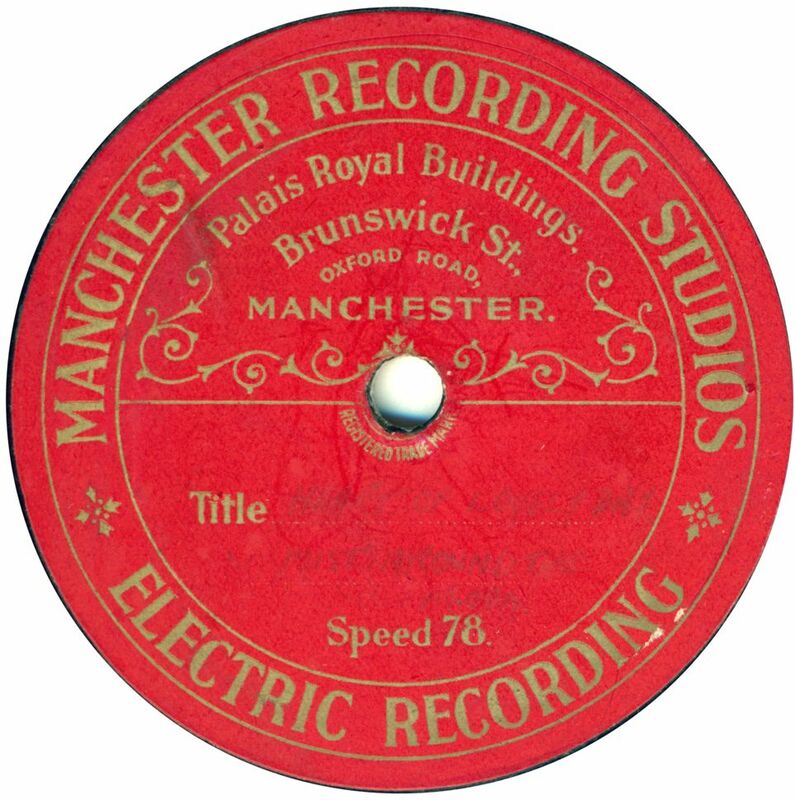 Apart from the historical importance of the occasion itself, also very important from a gramophonic perspective is this was the first issued electrical recording, 5 years before it became commercially used. This recording was taken by Guest & Merriman. 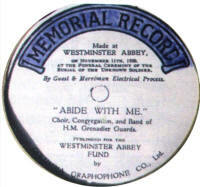 The record sold for 7/6 and the money to go to The Westminster Abbey restration fund. 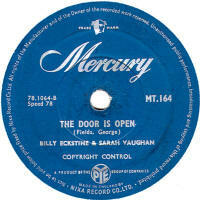 Mercury There are three versions of the UK Mercury label, produced by three differnt companies. They all date from the mid-to-late 1950s, so I'm not sure what order they appeared, or even if they were available at the same time! 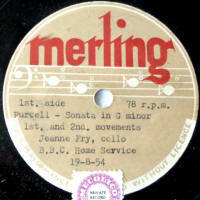 Type 2 shown was a Pye product, usually pressed in vinyl. Type 3 shown was made by EMI, who also produced 45rpm & LP records using this name, so I would assume they are the latest owner of the label identity. 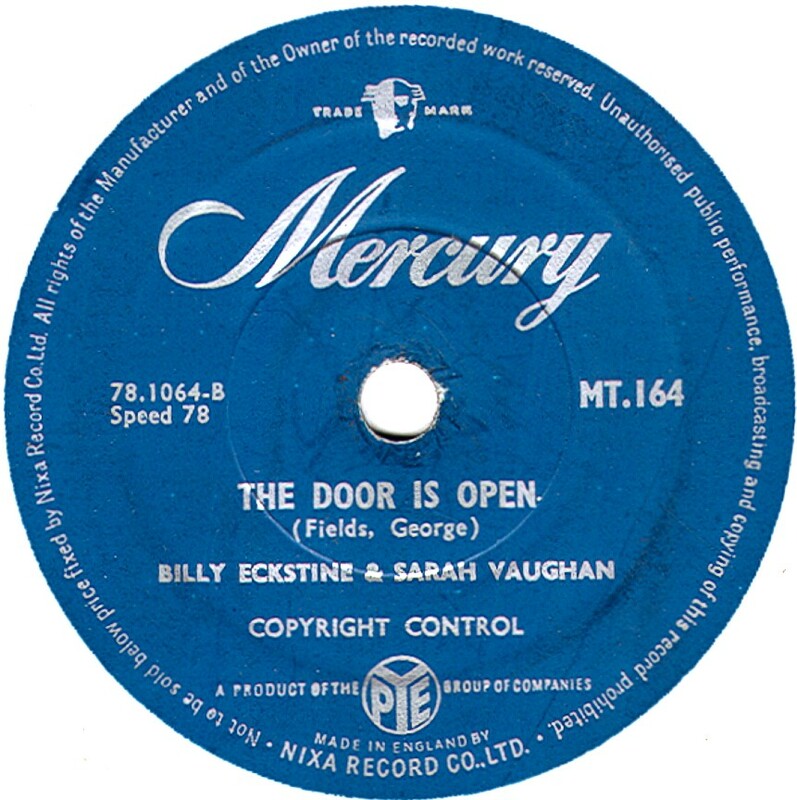 Mercury Sound Recordings Based at 355, Hornsey Road, London, this was a private recording company formed in 1952 with no connection to the well-known commercial label above. The business was quite short-lived, having disappeared by late 1955. Merling The label gives no clue to the company who preoduced the record, but at least we know it dates from 1954. It looks semi-official, as though the BBC themselves arranged for the recording to be made. 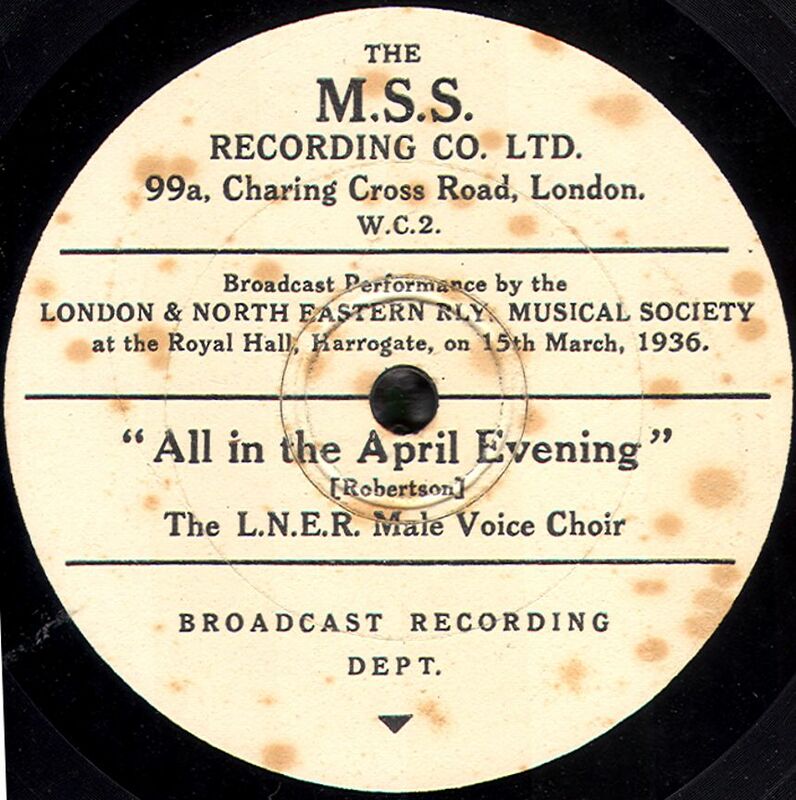 Metropole First appearing in April 1928, Metropole records were 3/- (15p) each, but tended to have strange couplings such as a dance title on one side and a glee club on the other! The catalogue numbering started at 1001 and ran to over 1300 before being withdrawn. 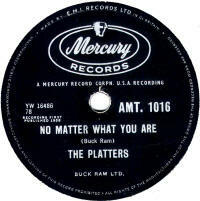 Matrix numbers were initially in an M-1 series, but these were soon dropped and the label just became an outlet (albeit an very expensive one) for Piccadilly masters, though to start with there were a number of occasions where the Metropole and Piccadilly recordings of the same popular numbers were by different artists. Metropole also took part in a fund-raising campaign for private hospitals. A selection of records were made available for 2/6. There was a ballot and competitors have to estimate the popularity of the record on the list. The first winner (Major J Reynolds or Kelvedon, Essex) won £1000 (a lot of money in those days). 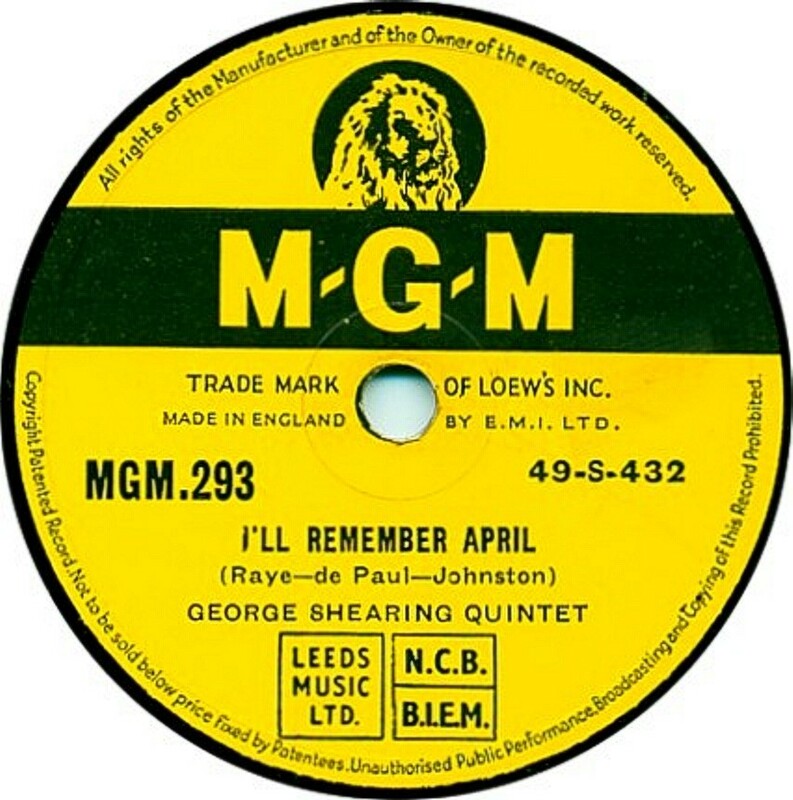 MGM MGM in the UK was an EMI label and mainly issued soundtrack recordings from Hollywood musicals along with a mixture of mainstream jazz and light orchestral music. 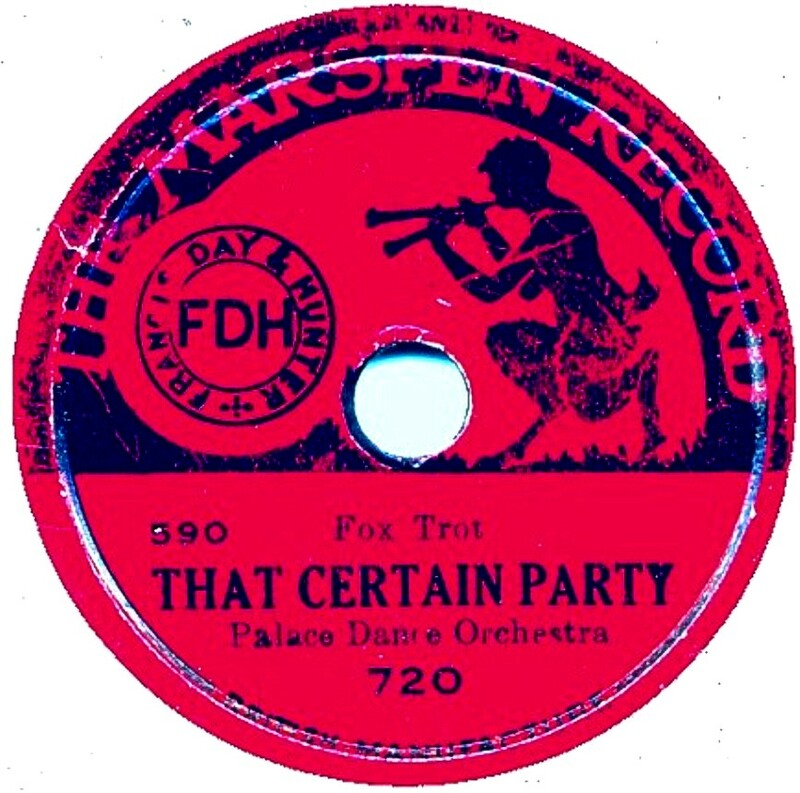 The label was introduced in the 1950s and survived into the 1970s, though, obviously by then, was no longer a 78 rpm disc. 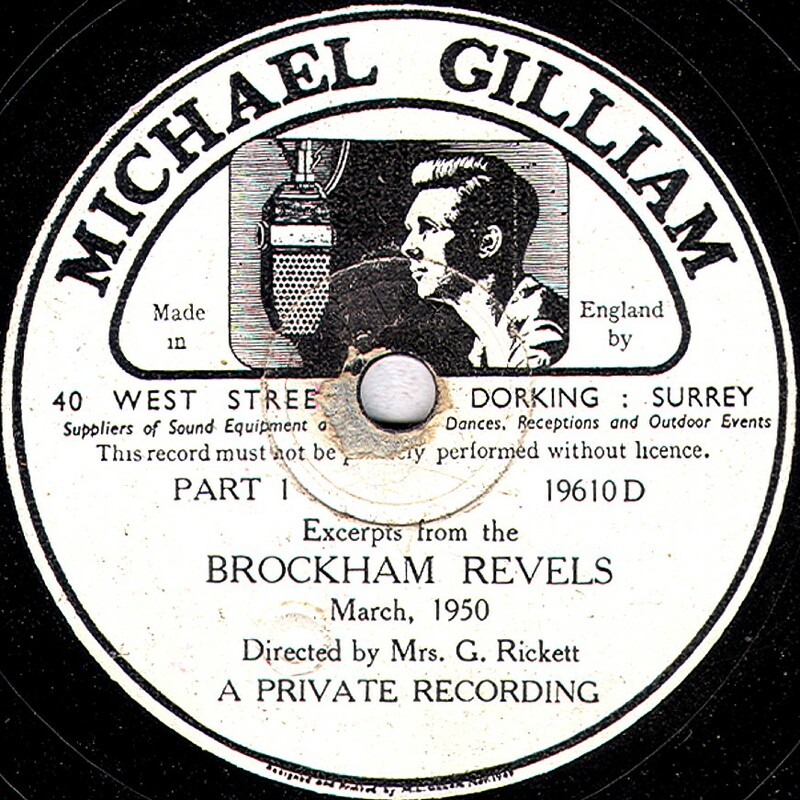 Michael Gilliam Michael Gilliam was a BBC programme producer and after WWII, he set up a private recording service, of which this image is an example. 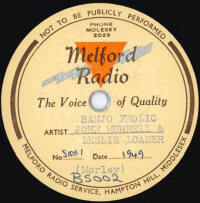 Midland Recording A private recording company based at Balsall Common, Warwickshire. This company was and probably still is based at Balsall Common between Coventry and Solihull and produced private pressings including one (on which I played as a very young boy) of Coventry Stoke Salvation Army band playing "Dumfries Citadel March" on one side and a hymn tune setting of "Showers of Blessing" on the other, which was ruined by the over-enthusiastic drumming of Mr Gingell. 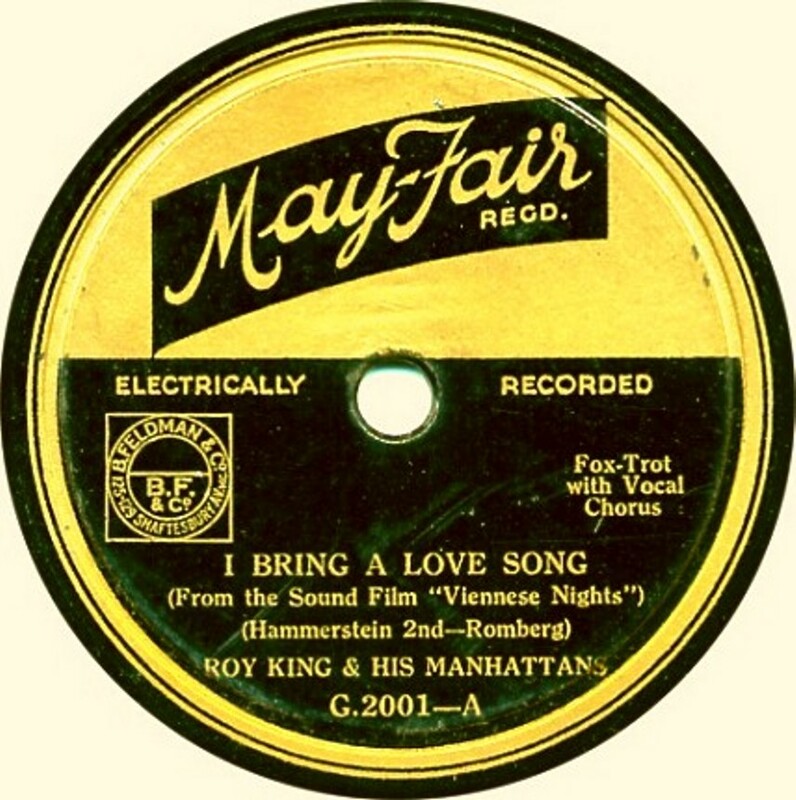 Mignon A 6" German-produced disc from 1912. The catalogue numbers started at 1 and reached at least 14. They were part of a "deal". 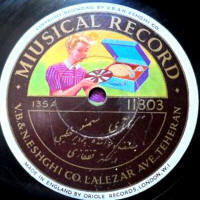 For £1, you got a mini-gramophone, and an album of 6 Mignon records, some needles and a carry-case. They were manufactured by Beka/Lindstrom. Mildmay Possibly a one-off issue. 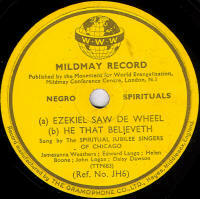 The record was made by EMI and issued (if that is the right term for a private record) in their private JH series. The record dates from about 1936. Millophone These were produced for a Mr. H. Mill from 1908 to about 1913, who ran the Millophone Record Company at 64, Bishopsgate, London. 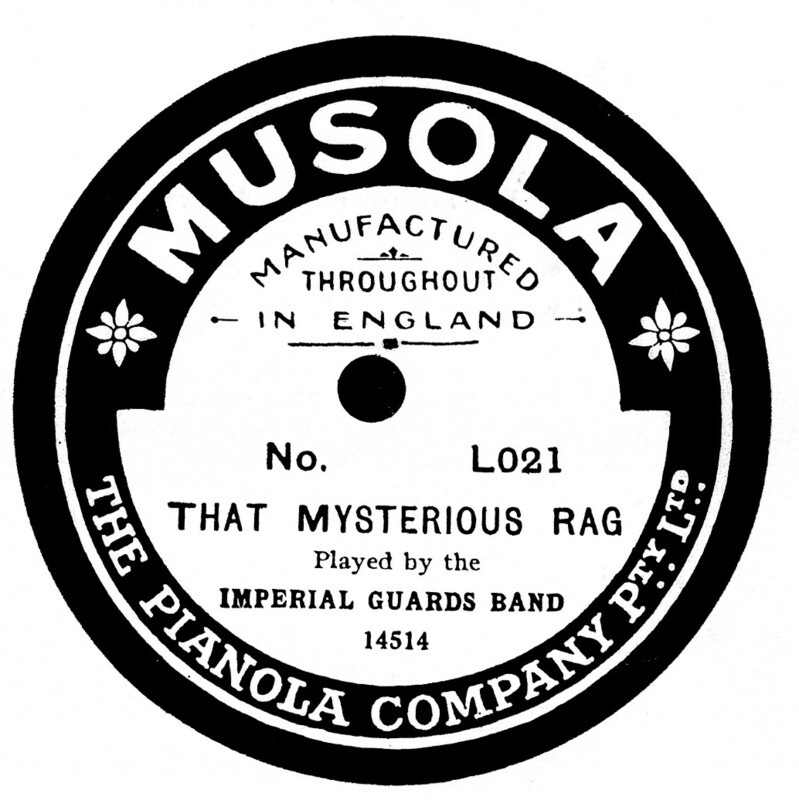 Initially, the label was just "Millophone" and Nicole masters were used. 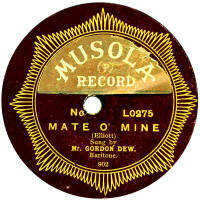 This type is extremely rare and some, or maybe all, had handwritten title & artiste details with a green label background. 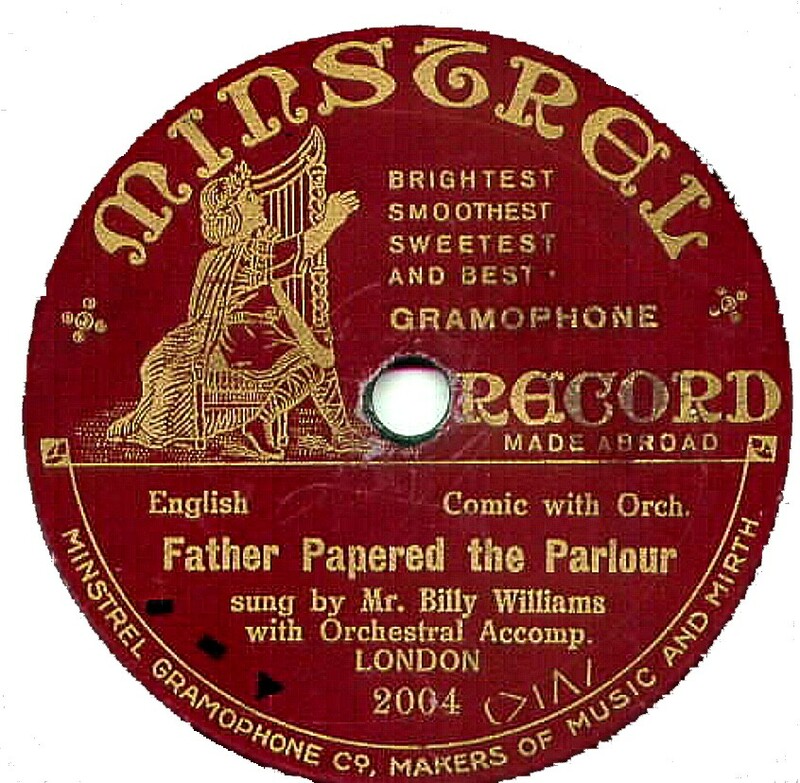 Then the name became "Millophone New Record" and drew from Edison Bell's "Bell" and "Winner" discs, with a green label. Then later it was styled the "Millophone New Celebrity Record"and drew from Edison Bell Velvet Face records. 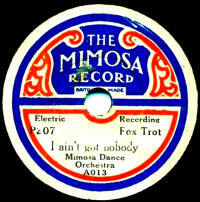 Mimosa Crystalate's most popular "baby" record was introduced in 1921 as a 5½" single sided disc with an M-100 series numbering system. 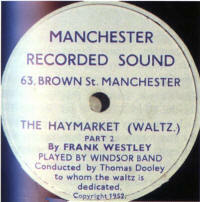 Soon becoming double sided with a P-1 series catalogue, these records sold for 6d at Woolworth's. They always had a non-copyright title on one side, to save on costs. Having reached about P-240, the size was increased to 6" and, confusingly, the catalogue started at P-1 again! This reached about P-240 (again) before being withdrawn in 1928 in favour of the new 7" Victory record. 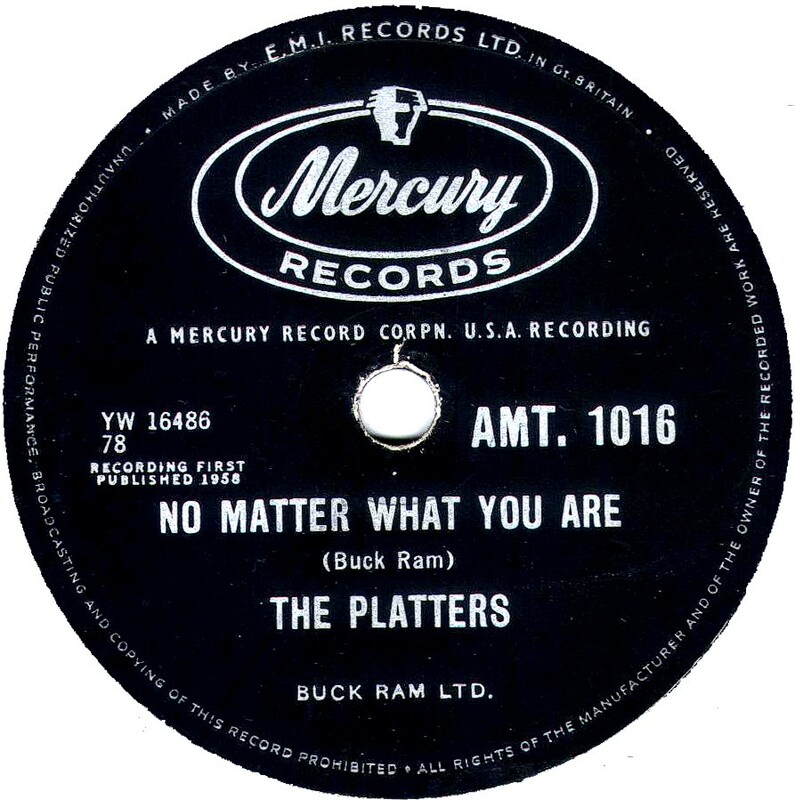 Matrix numbers were generally in an W-series for the 5½" recordings and an E-series for 6" (apart from some MS-01 range ones - see Marspen records), but there are some A-01 series ones which are (usually) edited dubs from American masters (from Banner). 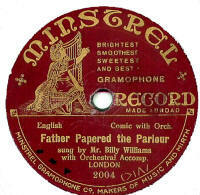 Minstrel Similar to "Herald" records, "Minstrel" were produced for a Mr E.W. Pidgeon of Auckland, New Zealand from 1913. There were two catalogue series: A single digit start (i.e. 1 upwards) to about 60 produced by Edison Bell in London and a second series starting at 2000 running up to about 2020 used masters from Favorite. The "Favorite" ones state "Made Abroad" on the labels. Click here to go to Adam Miller's site to see a listing of this label. Thanks to Rainer Lotz and Adam Miller for the label images. Please e-mail me or Adam with details of any of these records not on Adam's list. Modern The Modern recordings Company of Piccadilly Arcade, London was a private recording studio, but, as this example shows, they did produce properly pressed and labelled records. 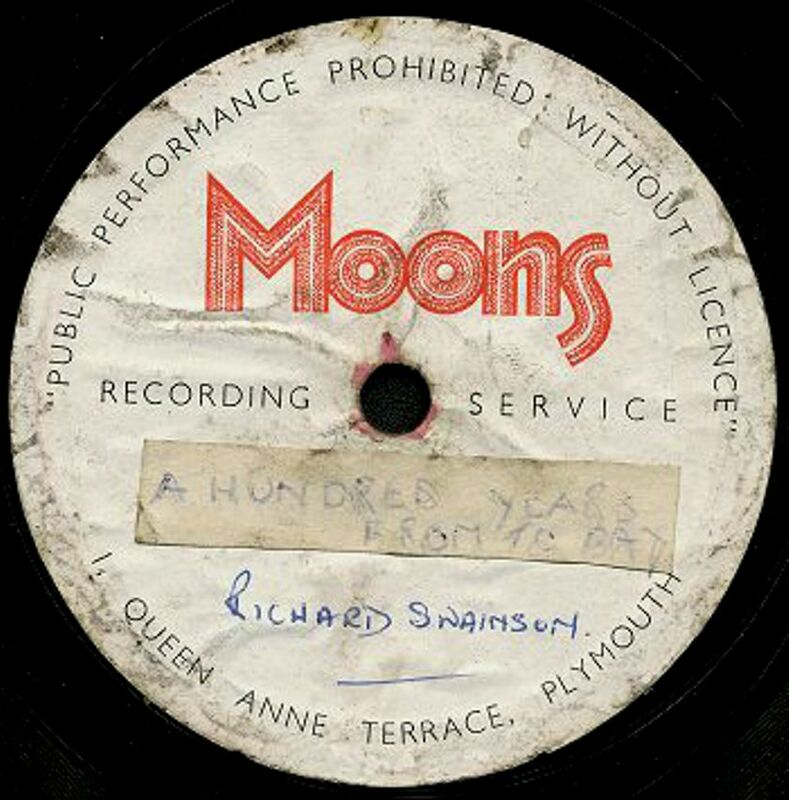 Moons Moons was an important record and gramophone shop in Plymouth probably from the 1920s at least. 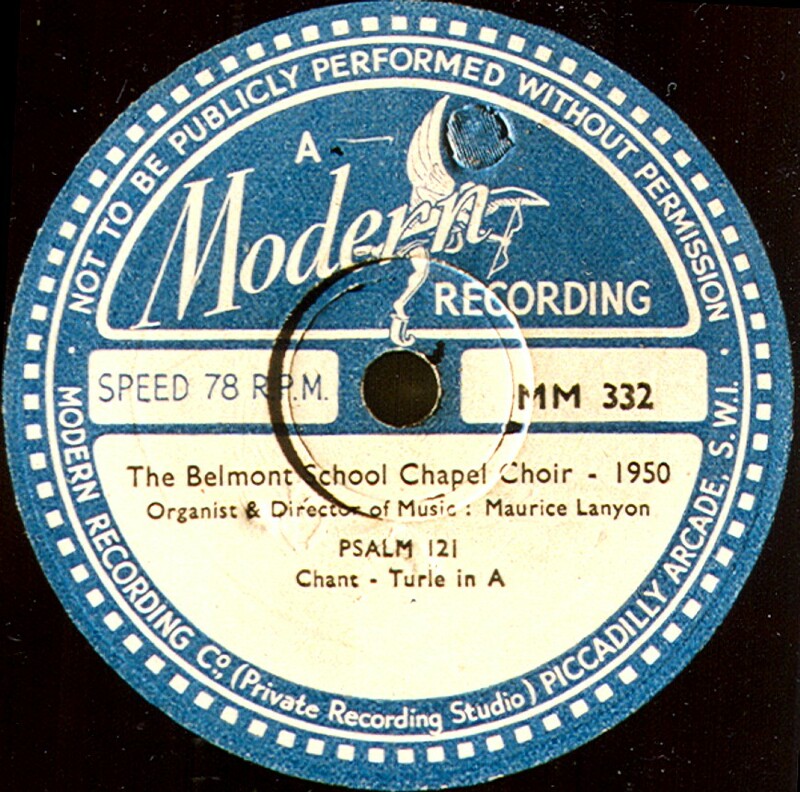 This record is likely to date from the 1950s, showing that they were offering a recordings service by that time. 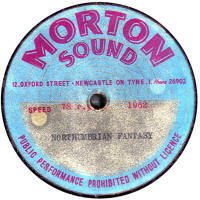 Morton Sound A Private recording studio in Newcastle-upon-Tyne. 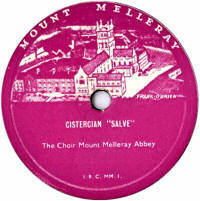 Mount Melleray Mount Melleray is an abbey in Ireland, and presumably this record was privately produced for the abbey. Mozart Edition This looks like a club label. It also looks very new for a 78rpm record, with the label mentioning "hi-fi", so maybe from the late 1950s, or even the 1960s! 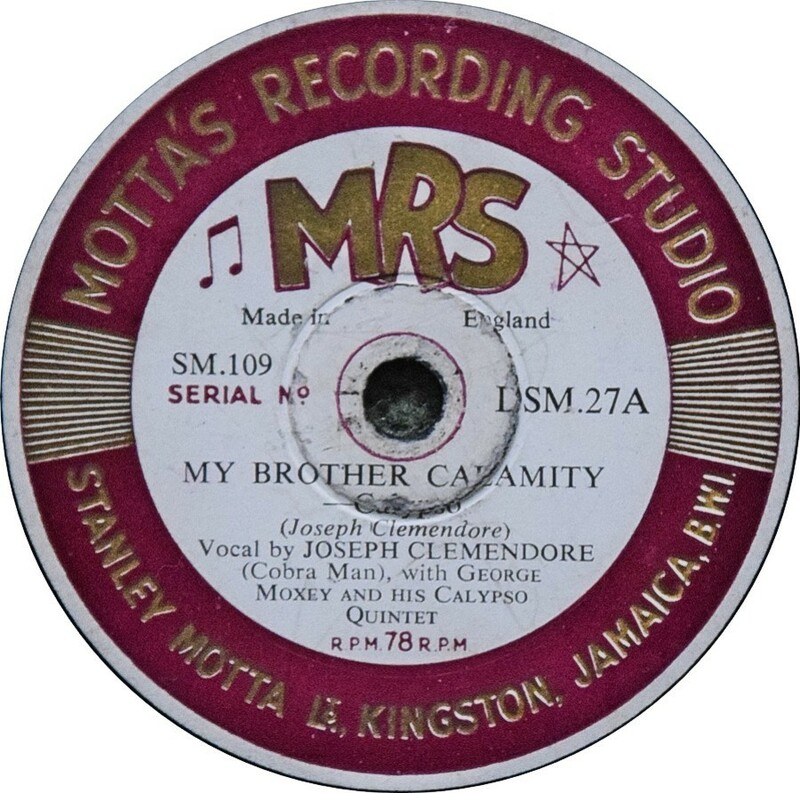 MRS The MRS (Motta's Recording Studio) records were manufactured in England, according to the label, for Stanley Motta Ltd, of Kingston, Jamaica. I'm guessing they date from the 1950s, but I don't know who was manufacturing them. Thanks to Richard Prout for providing the label photo. MSS Most collectors will be familiar with MSS as they were one of the major manufacturers of acetate (lacquer) discs used by private recordings studios. 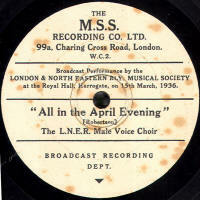 MSS also sold disc recording machines for use with their lacquer discs. 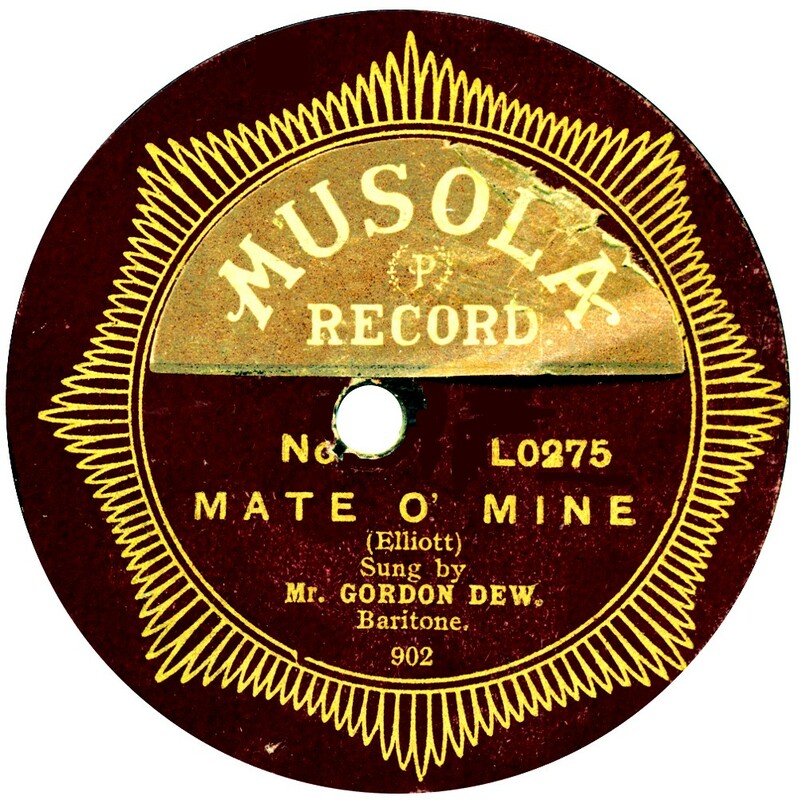 However, they also did semi-commerical records, such as the one seen here, which was pressed by someone else, probably Oriole or Decca, from an off-air recording in the 1930s. MSS originally stood for Marguetite Sounds Studios (later Master Sound Studios). It was started up by Cecil Watts and named after his partner (later his wife). Watts developed the laquer disc in Britain, after he was present at a recording session in the 1920s and seeing the huge effort and time wasted by the major record companies in setting up and using the thick wax masters. He developed the laquer discs in the early 1930s, but even so, the major companies didn't start using them until the 1950s, I believe. 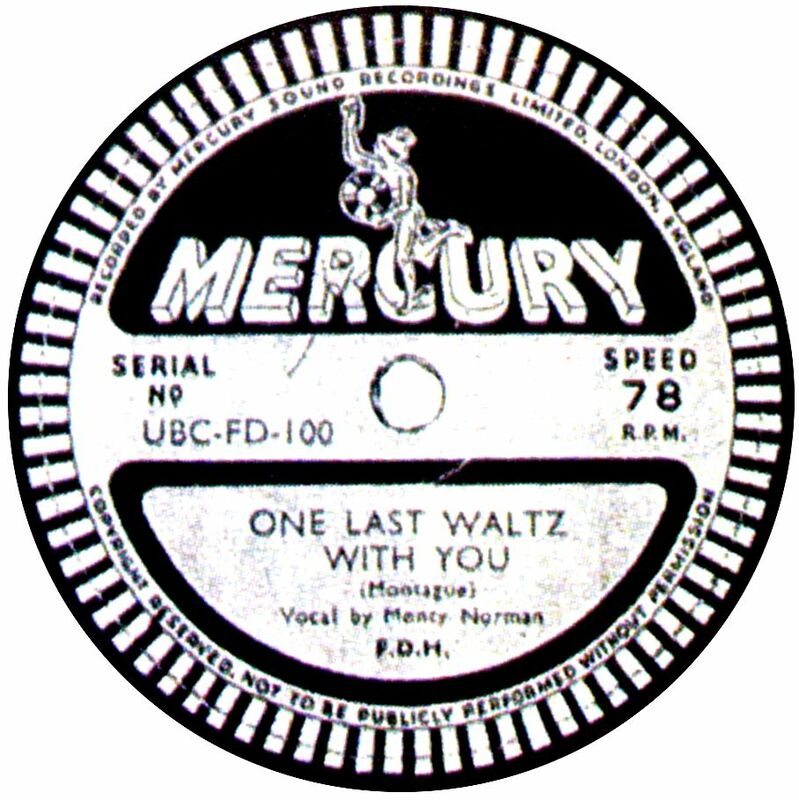 Watts, having sold the rights to his discs during the war, later became well-known for his invention of the "dust bug" which all vinyl collectors are familiar with and is a must to keep the nasty dust of your prized records, vinyl or shellac. 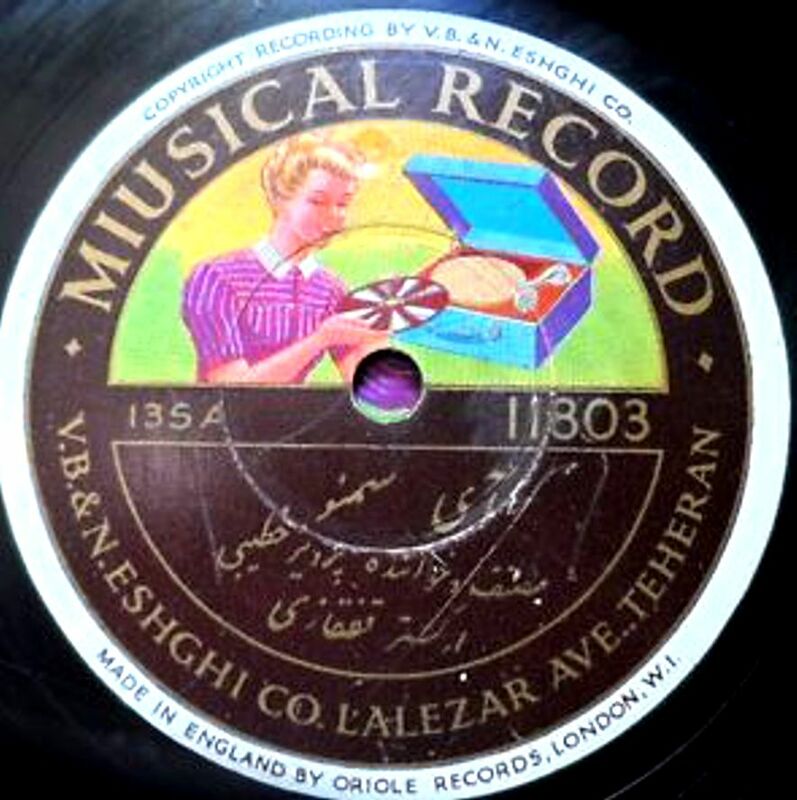 Musical Made in England for export to the Middle East. Any further information gratefully received! The second style does at least tell us it was made by Oriole. Rainer Lotz has provided the first label photo, and apologizes for the quality of the image. The second image (with the label name speclled incorrectly) is from Bill Dean-Myatt. Music Master These records were pressed by British Homophone Ltd using ex-Filmophone masters; the records probably date from about 1934. 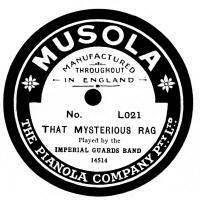 (sold in Australia) A close relative of "Phoneto", Musola appeared in 1917. They were pressed by Crystalate from Guardsman masters and exported to Australia. 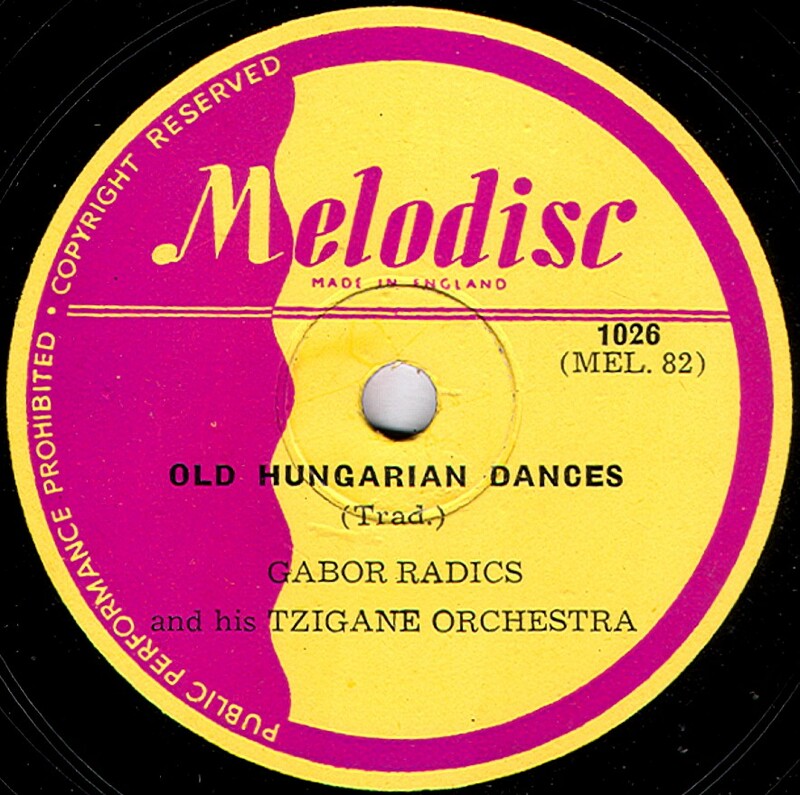 A colour label scan of the first design would be welcome, as would be details of any records. Thanks to Bill Dean-Myatt for the second image. My Record This was a 6" plastic or vinyl record made by Louis Marx & Co in the 1970s for children. 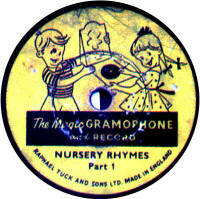 This must have been the "last gasp" for childrens' 78s?